considerable amount of writing on both group work and social work with the elderly, there is surprisingly little about applying this practice method to this specific age group. 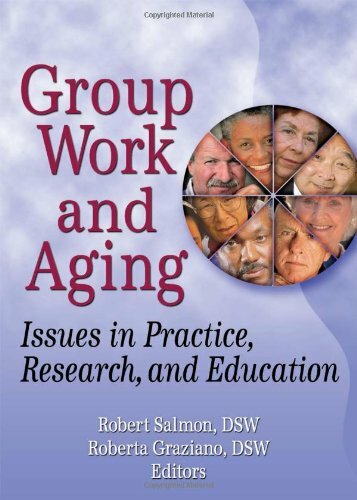 Group Work and Aging: Issues in Practice, Research, and Education fills this gap by presenting penetrating articles about a mutual aid approach to working with diverse groups of older adults with varied needs. Respected experts and gifted researchers provide case studies, practice examples, and explanation of theory to illustrate this practice method with aging adults, their families, and their caregivers.Group Work and Aging: Issues in Practice, Research, and Education discusses in-depth information on group work with gay and lesbian elders, caregivers, elders with Alzheimerâ€™s disease, service providers, special populations such as Vietnamese and Latino/a elders, and provides information on the use of expressive therapies like art, drama, and dance. Each well-referenced chapter presents high quality, up-to-date social group work practice strategies to prepare practitioners for the needs of the growing population of elderly in the near future.Group Work and Aging: Issues in Practice, Research, and Education discusses: the adaptation of group work practice approaches when working with older group members the use of a Record of Service as an analytical tool in group work with aging lesbians a chronicle of a studentâ€™s field placement at a drop-in center for homeless senior citizens the sociocultural reality of the Asian immigrant elderly residential substance abuse treatment for older adults mutual aid groups for older persons with mental illness the relationship between caregiver support groups and the marker framework of family caregiving telephone caregiver support groups group work interventions with elderly parents of adults with severe mental illness a program for the development and implementation of an intergenerational singing group support groups as an effective therapy at end-of-life the use of a mutual aid group with home attendants and much more!Group Work and Aging: Issues in Practice, Research, and Education reveals the latest examples of good group work practice with aging adults and their support systems, perfect for practitioners, educators, and anyone interested in and/or work with older adults.